Exceptional yachts are the result of a collaboration experienced owners with a unrestricted budget, world class designers and a great builders. Red Bird a 2014 Hylas 63 is one of the best examples of such a collaboration. Red Bird's designer German Frers has a reputation second to none and Queen Long is one of the worlds most experienced quality semi-custom builders. Every aspect of Red Bird's design and equipment is the best money can buy. 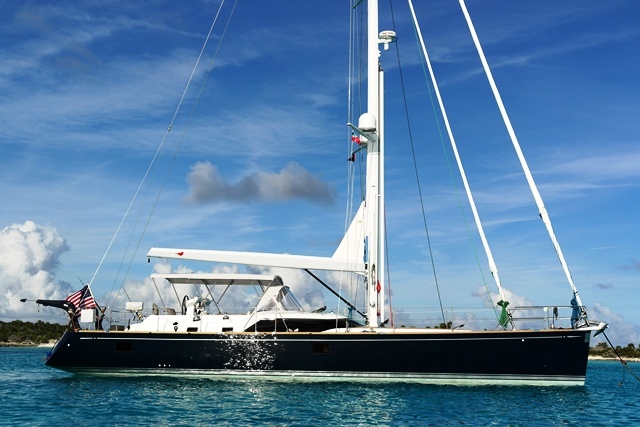 The owner invested over $900,00 in customizing Red Bird including an extensive list of builder options the custom interior decor, state of the art mast and rigging, electronics, and sails. The final result is spexperienced owners with a unrestricted budget, world class designers and a great builders. Red Bird a 2014 Hylas 63 is one of the best examples of such a collaboration. Red Bird's designer German Frers has a reputation second to none and Queen Long is one of the worlds most experienced quality semi-custom builders. Every aspect of Red Bird's design and equipment is the best money can buy. The owner invested over $900,00 in customizing Red Bird including an extensive list of builder options, custom interior decor, state of the art mast and rigging, electronics, and sails. The final result is a unique high quality performance cruising yacht of exceptional beauty and features with a current new replacement value of $3,000,000.